Mills, D. J., & Kohl, S. E.
Travel medicine practitioners, perhaps more so than medical practitioners working in other areas of medicine, require a constant flow of information to stay up-to-date, and provide best practice information and care to their patients. 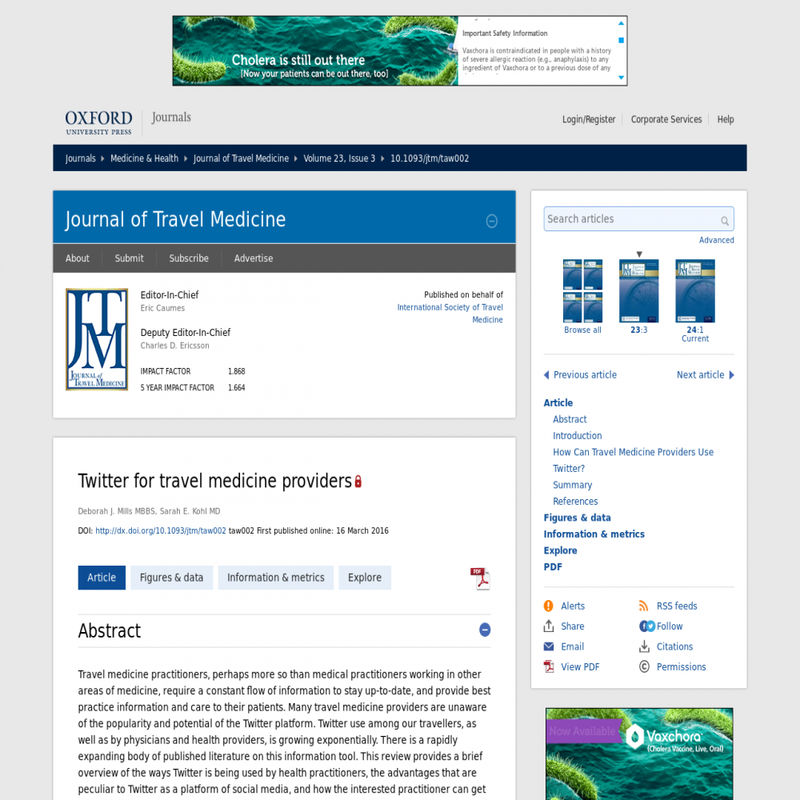 Many travel medicine providers are unaware of the popularity and potential of the Twitter platform. Twitter use among our travellers, as well as by physicians and health providers, is growing exponentially. There is a rapidly expanding body of published literature on this information tool. This review provides a brief overview of the ways Twitter is being used by health practitioners, the advantages that are peculiar to Twitter as a platform of social media, and how the interested practitioner can get started. Some key points about the dark side of Twitter are highlighted, as well as the potential benefits of using Twitter as a way to disseminate accurate medical information to the public. This article will help readers develop an increased understanding of Twitter as a tool for extracting useful facts and insights from the ever increasing volume of health information.